As the reader will have heard, in France, the person in charge of “Bocage” has taken a final bow with the 6,000th newsletter under that name. Thus ends an endeavour remarkable for its range and for the mass of work devoted, since 1979, to informing us on developments in historical revisionism. This newsletter no. 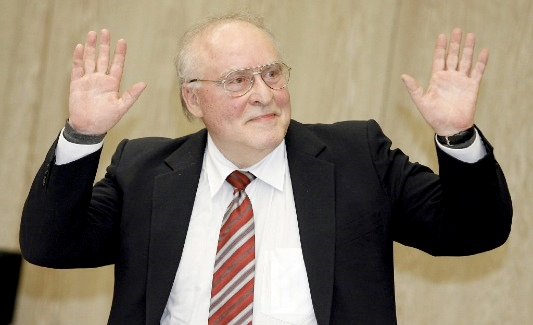 6,000 salutes a prestigious hero of revisionism, Ernst Zündel, born in Germany in 1939. Those who, given their relatively young age, do not know just who this amazing figure is can ask us for a brief biography. Zündel has shown such energy, such inventiveness and such disinterestedness that one may rightly assert that, without him, revisionism would never have been able toamass so many victories, victories that have resounded throughout the world. When finally the collapse of the “Jewish Holocaust” myth comes about, the tribunal of History will have to render justice to a sizeable number of revisionists and, to begin with,the Frenchman Paul Rassinier and the German Ernst Zündel, who never met but who, united in heart and spirit in one and the same truly heroic venture, haveindeed fought not only for the honour of their respective homelands but also for the honour of Europe as a whole. Our final message will be a tribute to Ernst Zündel, the German-Canadian revisionist to whom revisionism owes so much! For revisionists, Ernst Zündel has played an unparalleled role: with his leaflets, his periodicals – always punctual – in English and German, his help in disseminating so many books in various languages, his radio and television broadcasts, his videos, he has been everywhere, and always present to inspire the movement. In 1990, thanks to a formidable undertaking organised as he knows how, our cause achieved a particularly fine victory: the elimination from the plaques at Auschwitz of the figure of four million dead,replaced later by that of a million and a half. Therefore an end had to be put to Ernst Zündel’sexuberant and iconoclastic activity and it was on February 5, 2003 that this “hero” (the word is Professor Faurisson’s) was literally abducted at his Tennessee home; from that date, i.e. for the past 14 years, this manwas to find himself gagged, completelyunable to express himself on the subject thatwas his life’s work: to cleanse Germany, his country of origin, of the false accusations by which she is overwhelmed. After 7 years in prison, amongst which 2 in Canada in conditions close to torture and the rest in Germany, he would have to pass a probationperiod of 3 years, but the 10 years of silence were not to stop there: in order to maximise his chances of obtaining the right to return to his house in Tennessee, he would carry onmaintaining anear-complete silence for 4 years… and our readers will indeed have noted that at our end wedidour best to respect that silence. Alas, on March 31of this year the dreaded final decision was issued: while the door stays open to so many migrants, the United States, through the voice of a certain Ron Rosenberg, chief of the Administrative Appeals Officeof the US Citizen and Immigration Services, which acts by delegation of theDepartment of Homeland Security, refusedthe eminent revisionist entry to its territory for all time, thus forbidding him foreverfrom returning to his own home there,beside his wife! However, the law is clear: a person convicted abroad who seeks entry to the United States is to be barred only if the conducthaving led to conviction is “deemed criminal by United States standards”; but “denying the Holocaust and expressing anti-Semitic sentiments [which in fact E. Zündelhas never done – Bocage] is just not a crime underAmerican law”, noted UCLA law professor Eugene Volokhin a Washington Post column published, cynically, on April 24, Ernst Zündel’s birthday! It was only onMay 9 that we received a copy of thatiniquitousruling signed “Rosenberg”:readers who wishto have their own copy mayrequest itfrom us. Hi! I have read and reread that US ruling by Ron Rosenberg and am ever more disgusted. I am so disgusted by this hypocritical charade that I find it nearly impossible to force myself to write something about it! I had engaged a top immigration lawyer with over thirty years of practicalexperience with immigration law in the USA. This lawyer handled my casefrom the beginning! I followed all his advice and US rules and regulations to the letter. All things progressed well, I already lived with my wife in the USA at our own property, running our publishing business; I had been granted a work permit, a social security number, had a comprehensive health check-up, including x-rays, aids test,in short, I was fingerprinted by the FBI, even interrogated by a special agent of theFBI, passing all tests required, with flying colours. There was only one more visit to be undertaken with an immigration official beforeI would be granted permanent residence and could live and work in the USAfor the rest of my life! We were able to obtain my FBI file after my arrest and deportation!The special agent of the FBI, called Scott Nowinski, recommended to his headquartersthat they close the Zündel file, assuming that I would be given residency status! was only a matter of time and routine! We were totally taken by surprise, when out of the clear blue sky I wasarrestedduring a workday without warning, while framing paintings for my soon to be opened art gallery! The US officials did not allow me to call my attorney, and they did not have an Arrest Warrant! Instead they claimed that I had overstayed my visa, an obvious and blatant concocted lie, their cover story! In order to deport me from the USA. Due to this deportation, which came after the events of 9/11 (the attacks onthe World Trade Center and the Pentagon),I was imprisoned in Canada, todetermine my status for two years! Then I was declared a security threat to the nation of Canada, where I had lived peacefully and productively for 42 years, and was declared persona non grata by Canada. I was deported to Germany, arrested on the steps of the plane which had flown meacross the ocean in handcuffs from Canada and immediately imprisoned in Mannheim! There I was tried in Court for my writings and broadcasts done in the USA, whichwere perfectly legal in America. After a lengthy and grotesque trial in Mannheim I was convicted and sentenced to the maximum term of five years under Germany’s controversial holocaust-related post war laws! I lost all appeals, served every minute of the five-year sentence, plus another three years of “probation”, and was finally released on March 1, 2010! We, my wife Ingrid and I, fought in the US courts for 14 years, trying to return to the USA. Virtually always lost, also lost all appeals.We spent untoldsums on legal fees and court proceedings! The end result is the ruling by Homeland Security, signed by one Ron Rosenberg, which follows! There is also a critical review of this decision, by a US law professor from Los Angeles University by the name of Volkovh (? ),whichclarifies matters somewhat! The Zündel case reveals a great deal about the state of justice and human rights in America today! There is a vast gap in the USA between their “reality” and American propaganda! Ernst Zündel continues to describe himself as unvanquished and defiant,and he will not bend! Colour photo above: Ernst Zündel, in Toronto in the 1980s, displaying before Robert Faurisson, Fred Leuchter, Robert Miller and DitliebFelderer the building plans of the five Auschwitz and Birkenau crematoria, discovered by R. Faurisson in Poland on March 19, 1976. Those plans, kept hidden until then, enabledthe creation of scalemodels making it obvious thatthe alleged gigantic homicidal gassingoperations were physically impossible. See, in this regard, 1) An Engineering Report on the Alleged Execution Gas Chambers at Auschwitz, Birkenau and Majdanek (Poland) prepared by Fred A. Leuchter on April 5, 1988, 193 p.; 2) Did Six Million Really Die? Report of the Evidence in the Canadian “False News” Trial of Ernst Zündel– 1988, edited by Barbara Kulaszka, 1992, viii-564 p.